Like most comic book series, there is the classic good versus evil plots but minus the superhero powers and high-tech engagements with fantastical evildoers. Instead, it’s a teen drama series that addresses the struggle with good and evil within the human person while especially examining the dark sides of human greed, anger, and jealousy that make for intriguing mysteries. Each of the characters has their role to play in making Riverdale a more pleasant place to live while uncovering the dark secrets that underlie the seemingly perfect façade. Archie Andrews, (KJ Apa) along with best friends, Jughead Jones (Cole Sprouse) and Betty Cooper (Lili Reinhart), seeks to discover the identity of the murderous “Black Hood” who is terrorizing the small town of Riverdale. After several murders and the attempt on the life of Archie’s dad, Fred Andrews (Luke Perry), the trio enlists the help of Archie’s girlfriend, Veronica Lodge (Camila Mendes). In the midst of the investigation, they struggle with relationship issues, Archie with Veronica and Jughead with Betty, especially over the need for honesty and trust. Each one wants to protect the other love interest from getting hurt in the show’s multiple subplots. Foremost is Jughead’s incorporation into the Southside Serpents, a gang of which his father was a leader. He does so to help keep the Serpents from becoming drug dealers and criminals like the feared Goolies, another Southside gang. He does all this behind Betty’s back, even though he cares deeply for her. She in turn lies to protect him from the wrath of the Black Hood. The moral dilemmas, though concocted and de-proportionalized, address real struggles that many teens face in their daily lives. Is there ever a time in a relationship where dishonesty is better than honesty or falsehood better than the truth? We think we may be protecting someone from getting hurt, but in actual fact, we are hurting them by not being forthright and honest. We cannot protect those we love by fooling them into thinking everything is fine with us. If we are in trouble, support from those we care about is sometimes the one thing that helps us through a difficult situation. Betty learns this by finally telling Archie that she is in contact with the Black Hood. 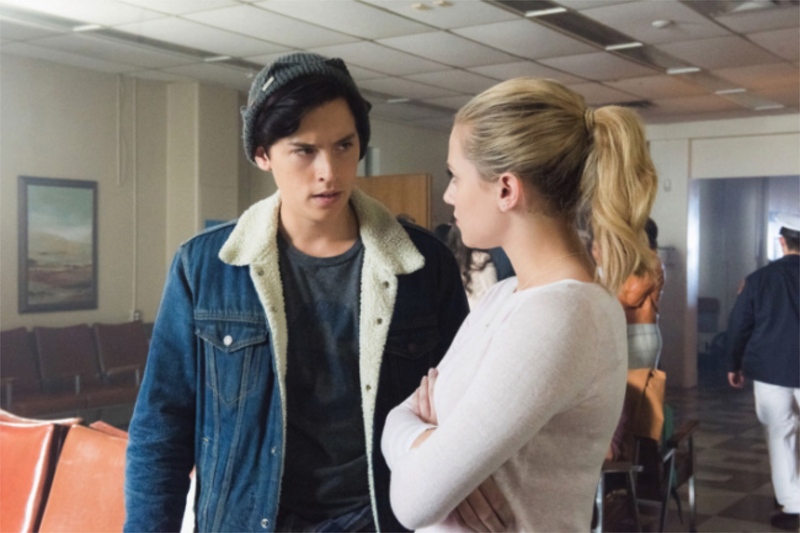 When Jughead finds out about the danger Betty has been in, he rightly becomes angry since he cares for his girlfriend. Since this is an ongoing series, their relationships quickly get resolved and they become united in fighting crime in Riverdale. Yet, what remains is Betty toying with the darkness inside herself. Do we let evil in or do we let love rule the day? This is what the series presents to us as the dilemma. Then there are the Lodge family secrets that trickle out across the series. Veronica’s father, Hiram Lodge (Mark Consuelos), who was just released from prison for financial schemes and mother, Hermione (Marisol Nichols), seem to always be plotting some financial takeover of the town to throw their enormous fiscal weight around. Veronica at first defies their conniving ways, but then demands to be “part of the family” and have a say in their business dealings, for good or for ill. She wants to help people who are in need, but discovers that money is not what makes someone happy, yet cannot somehow grasp that in her own soul. What do we take away from a series like this? Can good overcome evil deep within the recesses of the human heart? What prevents each one of us from becoming a monstrous killer like the mysteries the teens of Riverdale seek to solve? It begs for the need to take our own examination of conscience seriously. What resides deep in my own soul? What do I do with the battle of good versus evil within me? We all must face the darkness within at various points in life, sometimes daily. What prevents me from unleashing my worst self upon the world? I often think, “But for the grace of God, go I.” Truly, it is grace alone that keeps us in check. It is the grace of God, if we seek it, which prevents us from living out of the sin that pursues us and holds us hostage. It is the grace of God that allows the good to win over the evil in our hearts. I want to pray everyday for that grace. What do you do? Meet Jesus at the Movies! The Daughters of Saint Paul are an international congregation of women religious called, consecrated, and sent to evangelize in the spirit of St. Paul through our lives and all forms of media. We are present in 50 nations with over 2,500 Sisters carrying out the Pauline mission around the world.